The ALS is a mechanical interlocking system for actuators. It mechanically blocks the power supply, the indicator plate and the manual override of the actuator. The ASLP is an electronic interlocking system for actuators. The ASLP is a switch panel which controls the operation of the actuator. Operation of the panel is enabled by linear keys. Both actuator locking systems are custom built to the respective actuator, based on the standard Netherlocks linear key mechanism. The ALS (Actuator Locking System) is a mechanical interlocking device for motor operated valves. The custom made device locks and regulates operation of various parts of the actuator. By the exchange of mechanical keys between the different components of the actuator, operation of the actuator can be incorporated into mechanical interlocked systems. The ASLP (Actuator Switch Lock Panel) is an electronic interlocking device for motor operated valves. 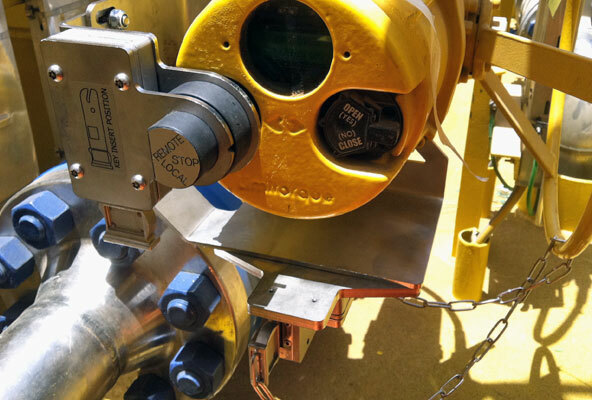 The custom made device locks and regulates local electronic operation of the actuator. Only when both keys are inserted in the ASLP, the actuator can be controlled with the control buttons on the ASLP. During operation both keys are trapped. When the valve has reached its fully open or fully closed position, the respective key is released in order to proceed with the interlocking sequence. The ASLP incorporates the actuator into mechanically interlocked systems. Additionally the ASLP enables simultaneous operation of multiple MOV’s. Free from periodic maintenance and invulnerable for sand, dirt, snow, ice, moist, etc.